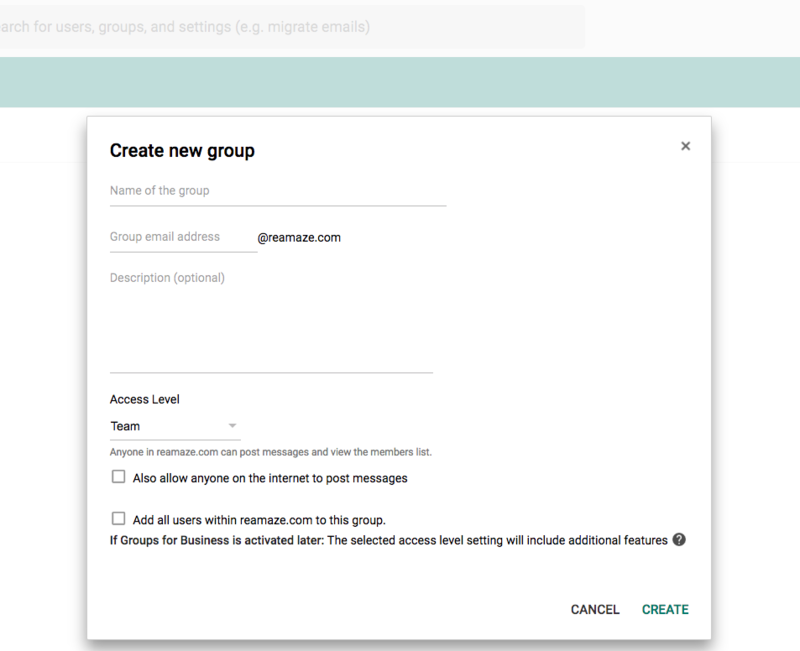 Some recent changes to Google Groups have made it harder to set up email forwarding to 3rd parties like Re:amaze. One unique issue is the enforced footer of the email that mentions the fact that "you're receiving this email because you're subscribed to XYZ Google Group". For those of you making the change, you'll be glad to know that this should be a painless transition, as the routing happens before the Group is contacted, and you can actually remove the Group itself, if you don't want the history. 1) From the Admin Console, click on "Groups"
2) Click on the big blue + button which will bring up a group creation modal. 3) This step is important. 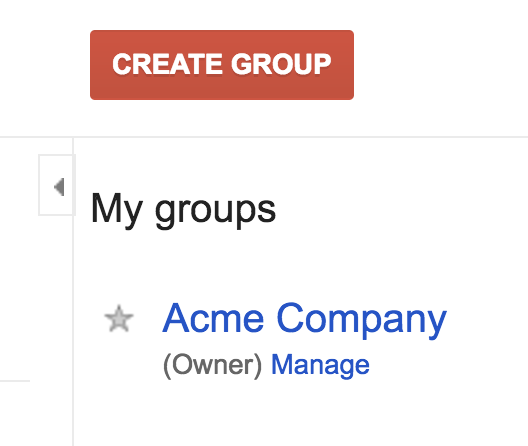 First, give your group a name, an email address (for example support@acme.com), a description. Most importantly, check the "Also allow anyone on the internet to post messages" option. If you don't check this option, forwarding WILL NOT work. 5) Next head over to your Reamaze Channels settings page and copy the channel address Reamaze has provided you. For example: support@acme.reamaze.com. 6) Add the copied Reamaze channel address as a group member. 7) Lastly, complete the forwarding request from within Reamaze. Simply click on the "Change" button and enter your group email address (support@acme.com). 8) Wait for the verification to complete. 1) In your Reamaze account, go to "Settings" then "Channels" and copy your Reamaze channel address. 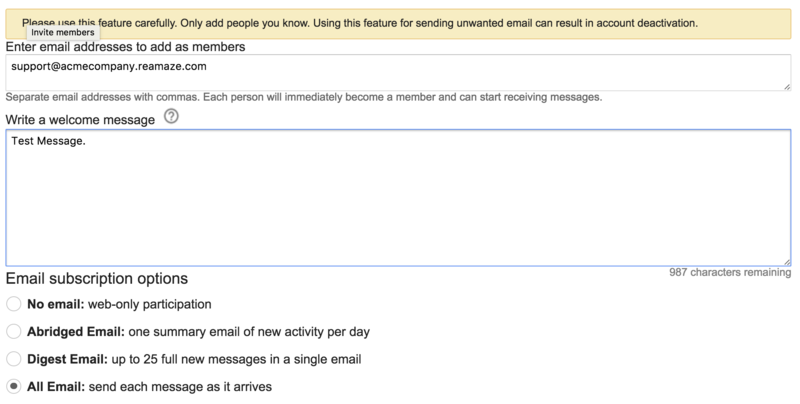 2) Now head over to your google groups account, log in and click on the "Groups" tab. 3) Click on "My Groups". 4) On the next page, you'll see the groups you belong to. If you're the administrator or have administrator privileges, you should see the "Manage" link right under the group name. Go ahead and click it. 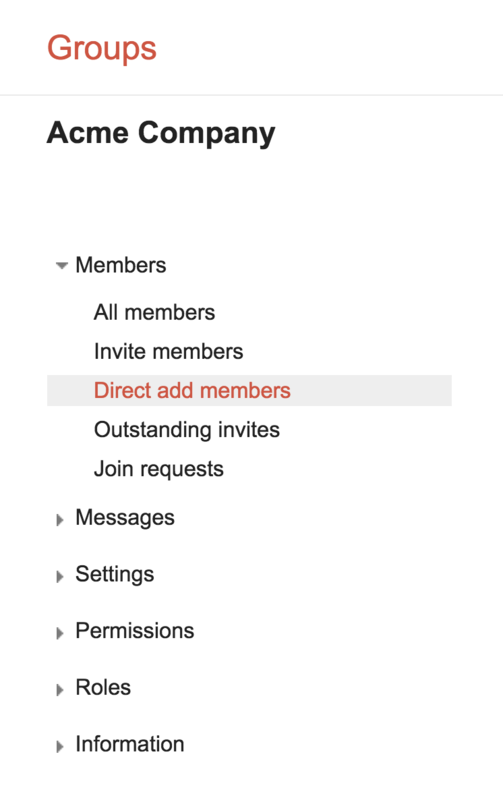 5) Next, on the left hand rail, look for the "Members" dropdown, select the "Direct add members" option. 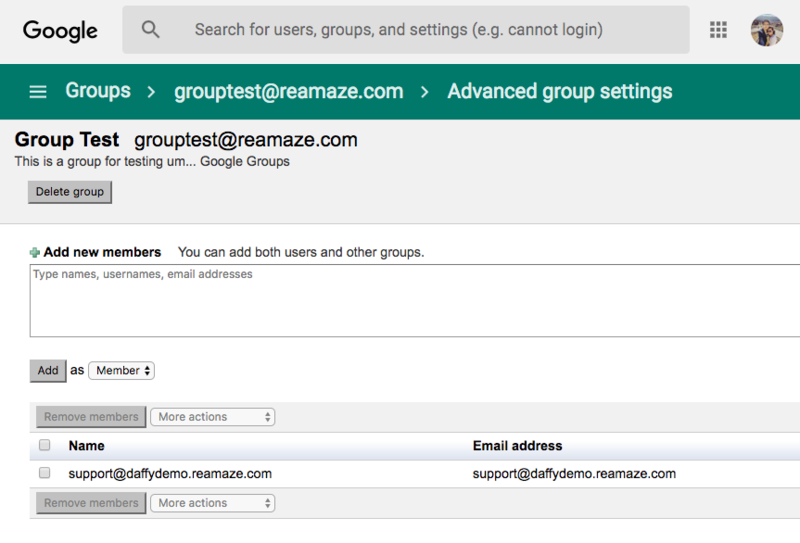 You need to manually add Reamaze's channel email address as the forwarding address to the group member list. 6) In the next screen, paste your forwarding address into the topmost section. If you choose, you can insert a welcome message, and select the "All Email" option. 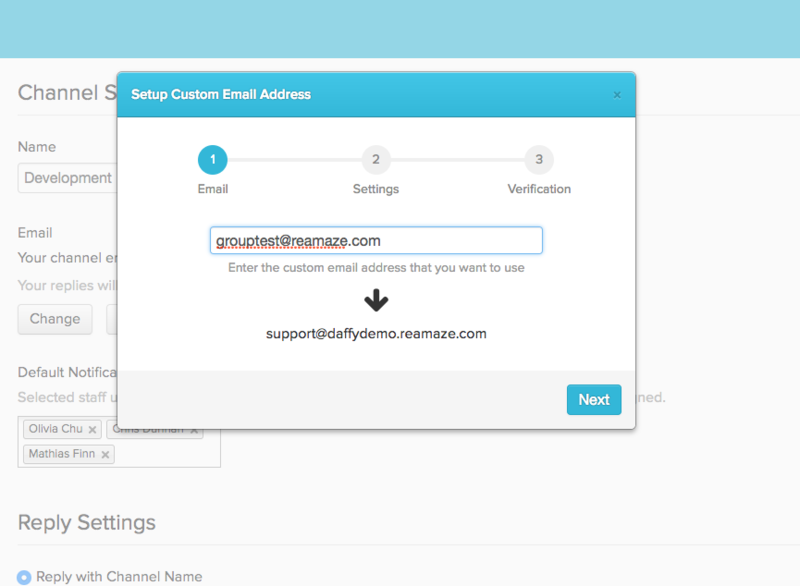 This will ensure that all incoming email messages are forwarding to your Reamaze account. Click the blue "Add" button at the top of the page when you're finished. 7) You will also need to finish up the verification steps to complete the connection.